I started a Garden last weekend. It is something I’ve wanted to do for quite a while. Yet, I’ve also known that I was not going to dig up a yard and spend my times on my hands and knees working a garden from the soil. It is a beautiful image but I’m not going to set myself up for failure and the death of helpless seedlings. I decided to make a deck garden. My tiny, townhouse backyard is a pit of dirt and mud from my dogs. My deck is mostly unused. I like having it but I’m not one to go sit outside just to sit outside. I do grill a lot and we have a table but the hot, humid summer has not made sitting or eating outside have a bit of appeal. But plants. So, I went and did. I wanted more than tomatoes however. I wanted squash and lettuce and onions and vegetables. My previous home was on a mountain with ten acres of land. Around the house was about two acres of cleared area. It should have been wondrous but it turns out I have no interest in maintaining a yard and there was an abundance of wild animals. Fighting against the wild turkey, bears, dear, squirrels, woodchucks, chipmunks, ground hods, birds and everything else was a losing battle. Hence, I like my deck. 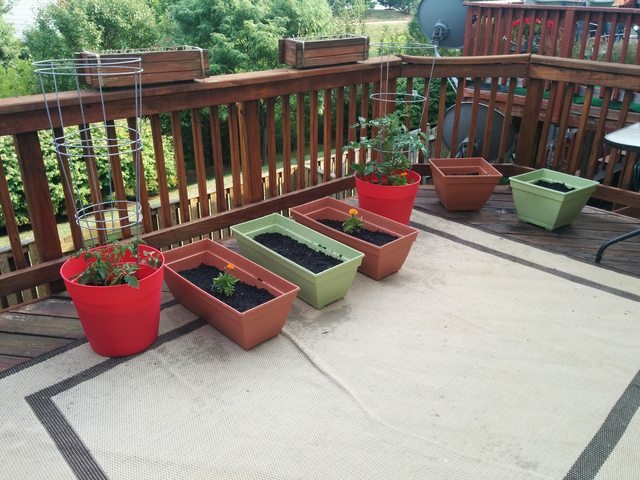 Some pots, some bags of pre fertilized vegetable garden dirt, a few packs of seeds and I was in business. Now it is only midweek and the first seeds are germinating. I have two little green shoots where my onions are. All four squash seeds and all four watermelon seeds have germinated as well. The larger tomato bush came with one tomato and now has four. The smaller one is growing and will hopefully start showing fruit soon. I have one little lettuce shoot so hopefully that will turn into more. If I do not have lettuce and onion shoots by monday, I will replant. I may have planted to deep. The seeds may not have been viable. It may have been to wet with the rain. Or, they may bounce up over the next two days as my squash and melon plants did.